There was a time not so long ago that my son’s choice of comfort food was anything potato: Twistix or French fries from Potato Corner or from the fast-food restaurants (McDonald’s, Burger King, Jollibee). His preference has changed, however, because he’s now asking for donuts each time I ask him what pasalubong (homecoming gift) he wants me to bring home whenever I leave the house. The brand of donut depends on where I’ll be coming from. He was seen by his pediatrician last June 7 at Makati Medical Center (MMC), and before we went home, he asked me to buy him a box of donuts from Country Style inside MMC’s canteen. Justin chose the flavors of the first two rows of donuts on the left (Boston Crème and Chocolate Marble), while I chose the last two donuts on the right: (Cinnamon Ring and Tiger Pawz). I chose the latter flavors because they’re the least sweet of all the donuts being offered at Country Style, but I like Cinnamon Ring more than Tiger Pawz. Justin could eat only two donuts in one sitting. That’s his limit, so he ate his four donuts in two days. 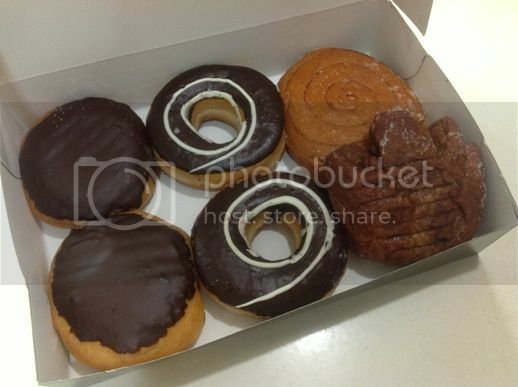 What’s your favorite Country Style donuts? This entry was posted in Country Style Donuts, Makati Medical Center. Bookmark the permalink.